This little Stickley table has fascinated me for years, but it was never the top project on my list. I think anyone interested in building arts and crafts furniture should build these two projetcs: a Morris chair, and this little tabouret table. That way you have a place to rest and a place to set your drink. 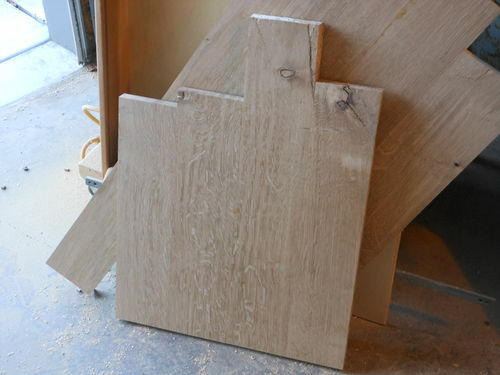 The 603 is more complicated than it looks, with offset half lap joinery and dovetails too. I actually can’t imagine designing a project that required the joinery to come together in such a way, but it’s an interesting project to test your woodworking skills. I thought the dovetails would be the only tricky thing about this table, but the half lap joints require some thought too. I started this project by milling some 1-1/2” square legs from rift sawn stock. Then I marked and cut the 1/2” mortises in all four legs. 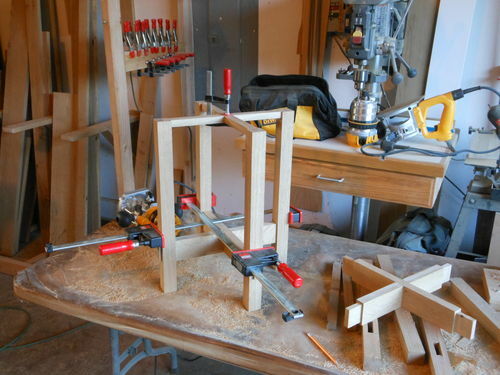 After carefully sizing the tenons, I was ready to work on the half laps. The funny thing about the half laps is that the notches are not the same depth. One notch is 3/4” deep, while the other is 1-3/4” deep. 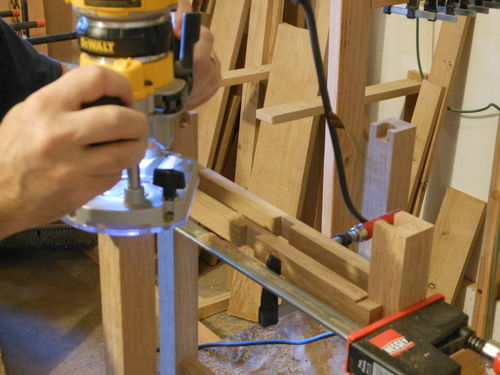 With the joinery complete, the curves on the lower cross stretchers can be cut. Only after the curves are cut do they truly become half laps. I used a spray paint can to mark the 3” diameter curve. This also matches the largest diameter of my spindle sander. Then I cut the half laps in the upper cross stretchers. These are just simple half lap joints. Then I used a combination blade to cut the lapped underside of the dovetail. I like to use a single 50 tooth combination blade for this operation rather than a dado set. 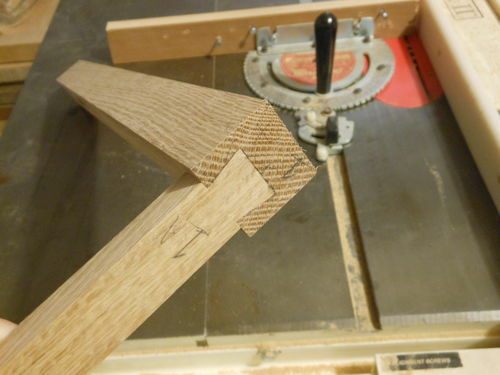 That way I can use the same setup to establish the shoulders on the dovetail joint. 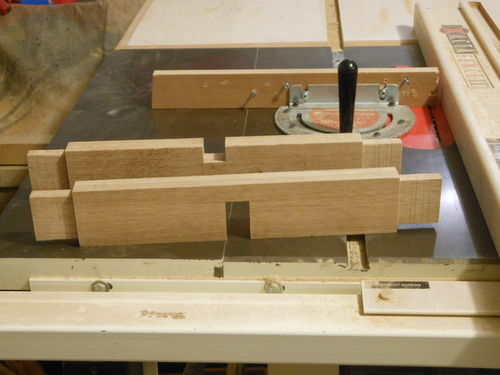 Then I made a sled to guide the dovetail cuts at the bandsaw. The sled is just a block of wood angled to 10 degrees, with a stop to register the upper cross stretcher in the same position for each cut. Cut one side of the tail down to your shoulders, then flip your workpiece and cut the other side. Then you can assemble the parts to dry fit the top cross stretchers. Use your tails to mark the location of the dovetail socket with a marking knife. Trace the knife mark with a pencil for better visibility. I use a compact plunge router and spiral bit to remove the bulk of the material. 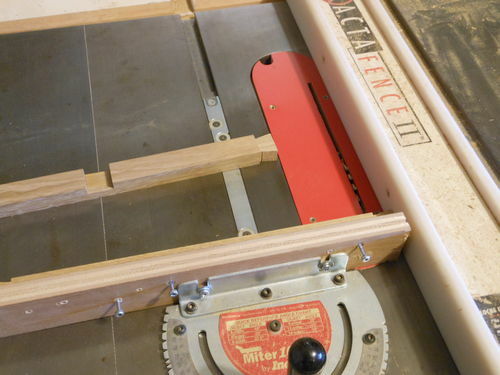 I take the upper cross stretcher to the belt sander, and tilt the table to 3 degrees. Guiding the workpiece with a miter gauge set at 90 degrees, I slightly bevel the end of the dovetail. 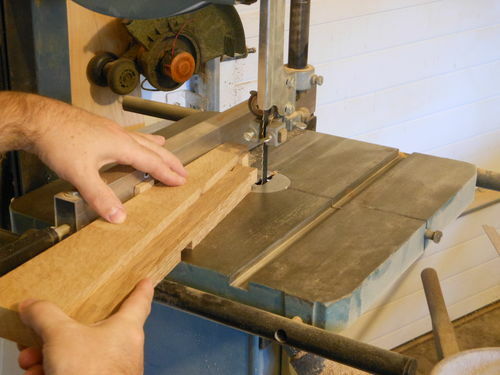 Use a sharp chisel to pare to your line. 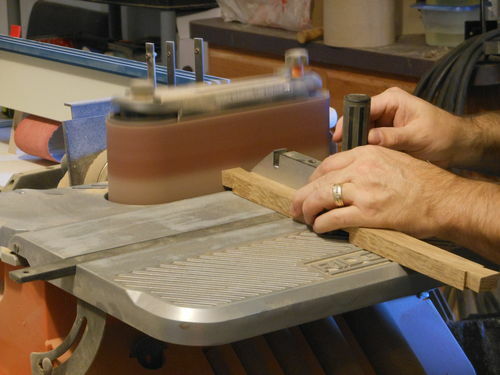 The shallow groove left by the marking knife is an excellent reference for setting your chisel. With the joinery complete, the hard part is done. Double check the shoulder fit on the dovetails. 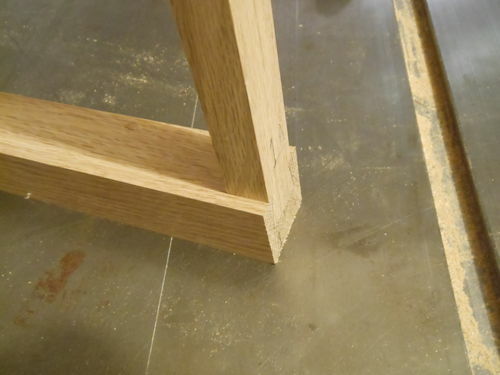 If there is a gap between the leg and the shoulder, try beveling the end of the dovetail a bit more. I glued up a panel for the top, which will be 18” diameter. The next steps are chamfering the through tenons and cutting out the top. I made my table similar to this without plans, so the dovetail never occurred to me. I just did an open mortise and tenon. Nice work Willie. I made this guy last year out of poplar. It was my first true arts and crafts project. I agree that it’s a great project to learn/practice several skills and requires very little materials. I screwed up my legs on my first attempt and it only cost me $5 or so to start over on them. My table supports many cold drinks throughout the year… especially football season. Charles – I didn’t do the dovetail either. It’s a nice touch, but I wasn’t prepared to tackle it at that time. Keep up the good work Willie. I’m definitely going to follow this build. I’m thinking of building a Limbert tabouret, and there should be similarities to the builds. Also, am curious how you’re going to cut the tabletop. 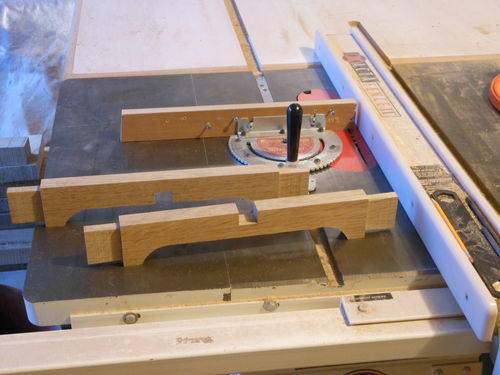 I’m considering doing it with a router on a trammel. Great post Willie, THANKS. I do have one question, why the 3 degree bevel on the dovetail? I’m sure you have a good reason for it, but I can’t figure it out. Very nicely done project and blog Willy and enough of a challenge to keep it interesting. 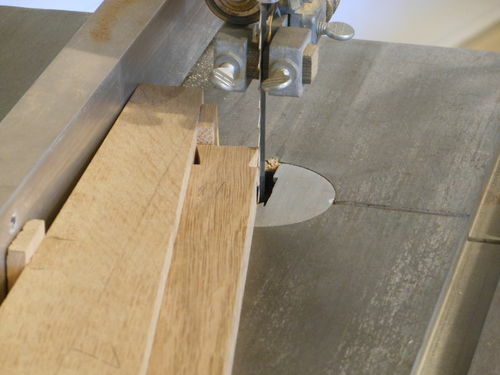 The router removes most of the waste from the socket, but I still have to chisel to the line. The 3 degree bevel helps ease the fit in case the chisel work wasn’t perfectly vertical. Very nice work Willie (as always). This will be fun to watch come together. Good show, very good show. I especially enjoyed your dovetailing method.